Finger Slayer is a free but ultimately shallow iPhone game. 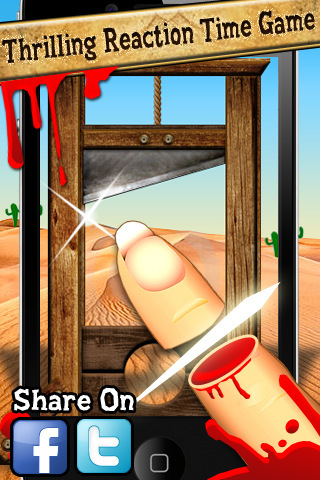 The premise is simple but intriguing enough for an iPhone app meant to waste a few minutes at a time: you put a finger under a guillotine or buzz saw and try to remove it before the blade, well, “slays” your finger. There are four different stages. Stages 1 and 3 have guillotines, and Stages 2 and 4 have buzz saws. Each stage has two modes: “Classic” and “Superstar”. Presumably “Superstar” is more challenging, but the difference between the two modes is negligible and their existence feels like an attempt to squeeze some extra life out of a shallow gameplay concept. The only reasons to play “Classic” mode are you’re really having trouble with the game or you want to get all of the achievements. Every stage is set up in the same way. When you place your finger on the starting point, a countdown is announced. At any time (within about five seconds) after the countdown ends the word “GO!” will flash across the screen and you’ll have less than half a second to take your finger off the screen before the blade flies down and you’re left with a bloody failure message. This can be surprisingly tense, especially after the first time you get your finger chopped immediately after the countdown ends. You try to beat the blade as many times in a row as you can, and the longer you last the more points you score. The problem with Finger Slayer becomes obvious once the initial tension wears off. The game is extremely repetitive. Besides the graphics, the only real difference between Stage 1 and Stage 4 is how fast the blade drops, and odds are the first three stages won’t be challenging enough for you to bother with more than once, making them good for nothing but racking up achievements. To its credit, Finger Slayer’s one gameplay component is executed well. The detection of your finger removal is spot-on and every time you lose you’ll have nobody to blame but yourself. Finger Slayer has an appropriately cartoonish look for an iPhone game. Despite the overly gory icon, there isn’t any graphic imagery in the game besides blood splatter on the screen when you fail. Each of the four stages conveys its mood well, an example being the Graveyard stage’s lightning strikes and haunted house with flickering windows. The audio is satisfactory. Each stage has unique music that fits with the themes, and the blades drop down with an eerily accurate clang or buzz. The only bad point is that the announcer who does the countdown and screams “Go!” can get old very fast. Finger Slayer isn’t a deep game, but as a momentary distraction it does the job. You can post your scores to Facebook and Twitter for your friends to see, so if you’re the type who enjoys trying for a gawdy high score you should consider giving Finger Slayer a try. 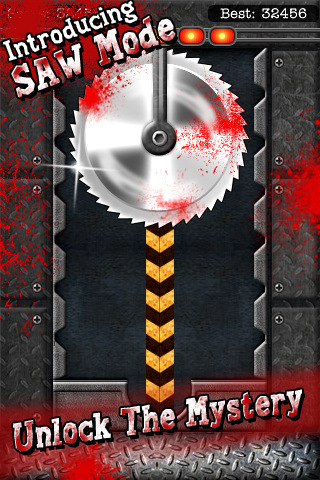 AppSafari review of Finger Slayer was written by Darius Reimm on June 8th, 2011 and categorized under App Store, Arcade, Free, Games. Page viewed 5034 times, 2 so far today. Need help on using these apps? Please read the Help Page.